This report sends an email to the association administrator with the invoicing details for all the umpires within a competition. 1. 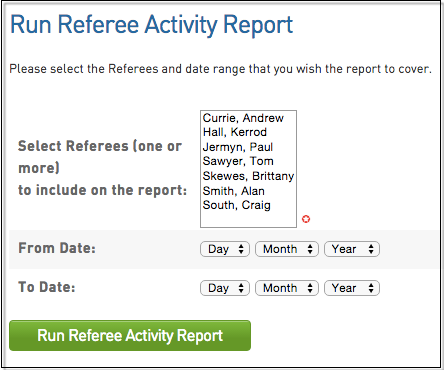 Hover over Comp Management and click Referee (Match Official) Allocations. 2. Click Reports and then click Referee (Match Official) League Invoice button. 3. Select the appropriate association from the Select Association drop-down box. 4. Choose the competition that the invoicing information is required for and enter a date range if necessary. If you do not enter a date range the administrator will receive the invoicing details for the entire competition. 5. Once the competition has been highlighted and dates entered if needed click the Run Referee (Match Official) Invoice Report button. This report shows the activity details for one or more of the umpires in the association. This allows the association administrator to easily view the complete movements of one or more umpires throughout a competition. 3. Select the Umpire(s) you wish to report on and enter in a date range if desired. Click the Run Activity Report to run the report. The Umpire MicroPay Report produces an import file for the MicroPay accounting software. This allows you to import the umpire payment records and process them in the MicroPay system. 2. At the next screen enter a date range for the report. This is the time period which will be covered in the report. If you leave this blank the report will cover everything umpire allocation across the entire competition period. Then enter an email address for the file to get sent too. 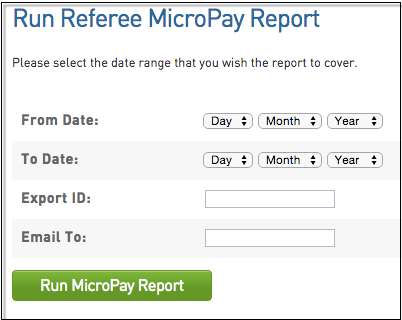 To run the report click the Run MicroPay Report button. 4. You will see a confirmation screen appear confirming the report file has been sent to the email address allocated.